This fresh, raw salad couldn’t be simpler. In about 1 minute you too can have a filling dish that provides 18 grams of protein, 4 grams of fiber, 4 grams of Omega 3’s as well as Calcium, Phosphorus, Potassium, Vitamin A and Vitamin C. And with about 285 calories per serving you can feel good about the choice. 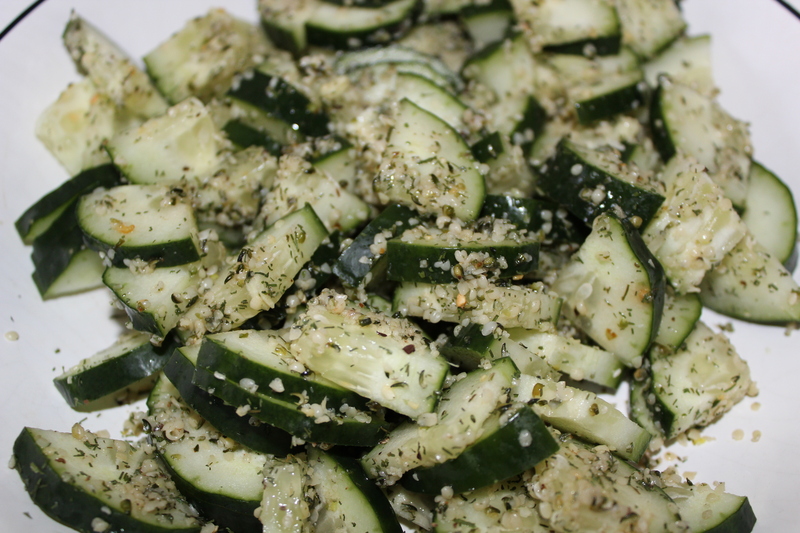 Cut cucumber in half lengthwise and then cut each piece in healf so you have 4 quarters. Slice into bite sized pieces and put into your serving bowl. Top with remaining ingredients and toss to combine. Eat! This entry was posted in Cucumber, hempseed and tagged fresh, gluten free, hemp, raw, vegan. Bookmark the permalink.